Description: From Sesame Street all your favorites friend have come to wish you a very happy birthday. 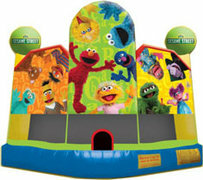 Come join Elmo and friends as they have a good time with you bouncing around. And don't forget to bring the Cookie Moster snacks!